From the day she arrives at the Biltmore, Tillie Reese is dazzled–by the riches of the Vanderbilts and by Mack Danvers, a mountain man turned footman. When Tillie is enlisted to help tame Mack’s rugged behavior by tutoring him in proper servant etiquette, the resulting sparks threaten Tillie’s efforts to be chosen as Edith Vanderbilt’s lady’s maid. After all, the one rule of the house is no romance below stairs. But the stakes rise even higher when Mack and Tillie become entangled in a cover-up at the town orphanage. They could both lose their jobs, their aspirations …and their hearts. Mack Danver stood stiffly beneath the archway in front of Biltmore House as its heavy wooden door creaked open. His chest tightened. It might as well have been the entrance to Central Prison in Raleigh. Sterling slapped his hand away. He bristled and opened his mouth to argue. Mack took a step forward. 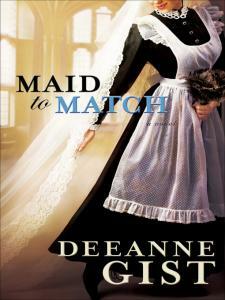 Deeanne Gist–known to her family, friends, and fans as Dee–has rocketed up the bestseller lists and captured readers everywhere with her very original, very fun historical & contemporary romances. Add to this three RITA nominations, two consecutive Christy Awards, rave reviews, and a growing loyal fan base, and you’ve got one recipe for success. She has a very active online community on her website at IWantHerBook.com and at Facebook.com/DeesCircle.